Clean Locker SAHARA - Paionia Furyokuki Co.,Ltd. 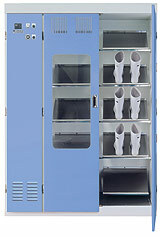 The clean locker “Sahara” performs drying and sterilization of the operator’s clothing and shoes at the same time using the effects of the ultra-violet sterilization lamp and warm air fan. It is a locker that is indispensable to production sites such as food processing plants where cleanliness is of the utmost importance. 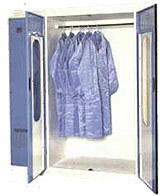 Deodorizing equipment is also available as an option. HEPA filters which can remove 99.97% of 0.3 μm dust particles found in ventilation air can also be fitted as options.